For a person who wants to follow trends and dresses fashionably all the time, selecting and buying the right accessories is an important step too. 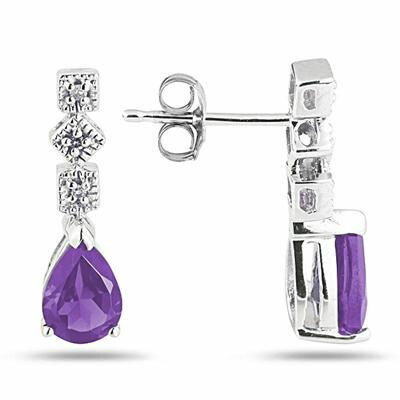 If you adore fashion that much, you must buy the Antique-Style Amethyst and Diamond Earrings. While the push back earrings are made of 14K White Gold, it is much different than other white Gold products. This difference is mainly in terms of design and weight. This antique style jewelry flaunts a beautiful arrangement of gemstones. A purple Amethyst is followed by three Diamonds. The Amethyst is 7x5mm in size while the diamonds are much smaller. The item is so light that you will never even feel it on your ears. Wearing it all day long is never a problem. You can pair it many different kinds of casual and occasional outfits. Its beauty will make you feel attractive every time you will wear it. The earring is a valuable worth owning. We guarantee our Antique-Style Amethyst and Diamond Earrings, 14K White Gold to be high quality, authentic jewelry, as described above.